This is going to sound like a repeat of a recent story but it is not – dredging just seems to be an application that Hydra-Tech Pumps are being called on to do more and more lately. This story is out of New Zealand – our friend Doug Kirby, who is two years new to Hydra-Tech Pumps as a representative and distributor of our products, is involved in exactly the kind of dirty jobs you would expect with a name like Slurry Services. In preparing for a significant dredging project on the west coast of the north island of New Zealand, Doug ordered a 6” Sand / Slurry Pump (S6CSL) from Hydra-Tech Pumps as the key component in their approach to the job. The project they were preparing for involved removing river sediment from a marina to create a channel to allow better access to the ocean for the Coast Guard rescue boat and recreational boats as well. They had been launching off of the beach and this work would prevent this and make the boaters’ lives a little easier. Doug and his team put together their barge / excavator / pump set up (for anyone who has ever watched Discovery Channel’s Bearing Sea Gold this concept is familiar) and got to work. The biggest challenge was ripping up the bed – a mixture of compacted fine clay and sediment as well as larger solids and debris. 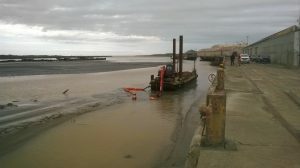 They worked to tear up the bed and move the mixture to the pump and operated only when the tide was going out so that the sediment wasn’t coming back to where they were working. The water and solids (less the tree branches and other larger debris) was pumped over 1000 feet away. Despite the very difficult dredging conditions they averaged 32 cubic yards (86 tons) of solids per hour from day 1. The project was a success and has led to additional opportunities based on their short set up time and efficiency in getting the job done. The next job is on the east coast of the island where the sediment is primarily sand and flows more easily, here over a similar pumping distance they expect to move in excess of 60 cubic yards (162 tons) of material an hour. Applications like many other things seem to come in waves. 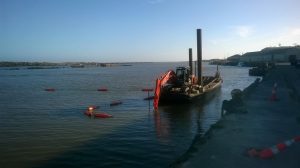 Right now it appears as though Doug and many of our other marine / diving customers are putting Hydra-Tech Pumps to work to earn dredging jobs and exceed expectations!